Azhar Usman jokes that he looks like “that guy from LOST. Not the Indian one, the fat one!” The Chicago comedian uses humor to poke fun at racial stereotypes, referencing his own life as the child of Muslim immigrants growing up in mostly Jewish Skokie. 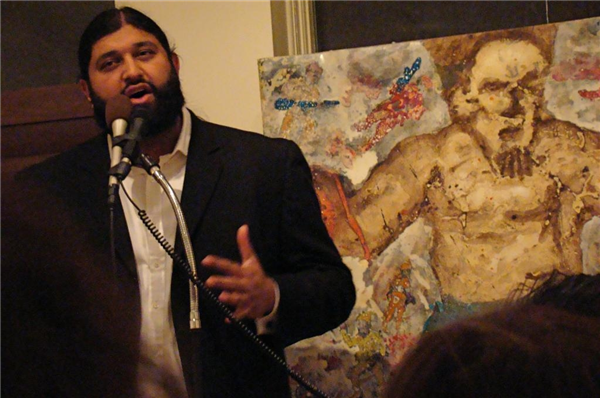 Usman recently did an extended set in front of an intimate audience at Chicago’s Th!nk Art Salon as part of their ongoing War & Peace exhibit. Usman performs regularly alongside a Rabbi/comedian in a show they’ve dubbed the Laugh in Peace Tour. The evening took a surprisingly deep and personal turn when Usman shared a story about learning to parent four young sons inquisitive beyond their age. Click here to hear Usman’s entire set at the Th!nk Art Salon, recorded by Chicago Amplified.